Dog & Puppy Training Tips & Hints From a Louisiana Master Dog Trainer. The dog, often referred to as a poor dumb animal, has proven through the years that it is not a dumb animal, but generally smarter than the person who owns him. This leads owners to seek professional help to correct annoying problems that the owner either has unwittingly caused or has not corrected in the past. For example, I answer the phone to hear a client telling me that I have to come to his home and fix this "Son of a Blue Eyed Mongrel," or he is going to strangle him. The problem is this: "THAT DOG is digging up all of the flower beds that were just finished." "Did the dog do any of this type of behavior in the past?" "No, he did it only after numerous hours of digging and planting." What has been overlooked is that the dog watched the owner dig and turn over all that fresh dirt with all those new smells of decay, and the dog wants to find out where those smells are coming from. He digs, just as the owner did, and destroys all that work. Would it not have been better to isolate the dog and prevent him from seeing what was going on? Would it not have been better for both dog and owner if the dog had been denied access to that area? One solution would be to introduce the dog to the area all over again, and, if necessary, place a barrier around the gardens to prevent him from entering them until he understands that this is not his playground. I do not know of any dog that would not be curious of freshly upturned earth. The smells are too tempting, and the curiosity of where they originate are too great. Tall plants are another way for a dog to cool himself. The freshly planted flowers provide shade at the base, and the newly turned earth creates a cooler place to lie. Besides being curious of the smells, the dog will lie right on top of the flowers in an attempt to find a cooler place to relax. 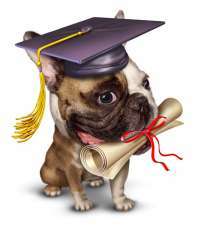 The following are abbreviated versions of our training programs that may be applied to any breed of dog. Some dogs may require a little more training in order to eliminate a certain problem, but do not despair. Help is available, and it is not as costly as you may believe. Puppies - Don't be too anxious to train the pup immediately. There is too much emphasis put on training a puppy the minute it arrives at its new home. Training is important, but formal training does not have to start immediately. 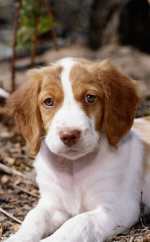 Your pup has just been taken from its mother and littermates, and familiar people, surroundings, and smells. Now in a new home, it must readjust to everything around him. Allow the pup two weeks to adjust to his new surroundings and family before beginning any training. He must know you and his new home prior to placing any further burden on him. Most puppies are brought to their new homes between six and eight weeks of age. This is an important period in the dog's life. The "Fear Imprint" cycle of all dogs begins around eight weeks of age and lasts for approximately two weeks. During this period, any traumatic experience could have a life long effect on the dog. Because of this critical period, formal training should be postponed. Some pups are a little slower to mature, so I like to extend the beginning of formal training to 16 weeks of age. At this age, he should have received all of his necessary vaccinations to protect him from disease, and his level of attention has increased, making it easier to comprehend the lessons to be taught. No - The most overused word by owners. Without any doubt, the most overused word by many owners is the word "NO." Logically, the word "No" influences the human psyche to "Stop" whatever they are doing, and wait for instructions to be given for the correct action. This is the response taught by our parents and their parents before them for as long as the word has been in existence. Unfortunately, the dog does not perform in accordance with logic, but with instincts and learned behaviors. Most owners will use the word at the beginning of their instructions as a declaration to gain attention. Such as, "No, don't dig," "No, get off the sofa." "No, get out of the garbage." "No, don't jump on me." "No, stop barking." The dog hears "No" so much that the word loses any meaning or effectiveness, and he becomes numb to it. He assumes that humans make this sound prior to speaking, and the word is nothing more than a noise that is not to be given any attention. In reality, the word should be used sparingly, but not in these situations. If the dog is doing something that is not desired, use an individual command word for that action, and eliminate the word "No." Using the examples from above, whenever you see your dog digging, try using the command "Cut" or "Quit." When found jumping on furniture or people, what you really want is for the dog to get off, so use the command "Off." If found rooting in the garbage, try the command "Leave it." To stop the dog from barking use the command "Quiet." If nothing else seems to fit the situation, there is always that word that sounds as if something is caught in your throat. "AAHHHT." All of these commands, along with the appropriate action, need to be taught to the dog. What you achieve is a dog that responds to the command and proceeds with the desired action. You are actually building a vocabulary for your dog, and one that he will understand. This may sound all too simple, but it is a fact. Prior to the death of my Search and Rescue dog, she was able to learn, understand, and comply with 42 different commands. I tell my clients to minimize the use of the word "NO." It does have a use, but it must be used sparingly. Save it for when your dog is in a situation where he is in danger or if someone is in danger of your dog. Then it should used loudly and with conviction as if the "Dog God" has descended from the clouds to bring death and destruction upon him. Give your dogs their own words by which to work and live. Use simple, single word commands for each action taught. You will find your dog learning the lessons much faster, and giving a faster response to your command. When he understands the desired action in conjunction with the command, you and your dog will be happier for it. Shake Can - Inexpensive training equipment, that works. The Shake Can has been referred to by various trainers as a means of correcting your dog from ill behaviors. They will provide you with partial information on the use of the can, and when it fails, you return to them to have the problem corrected. The information that follows provides you with the proper construction and use of a shake can. The purpose of the Shake Can is to create a distraction and gain your dog's attention. Training requires the dog's attention if you expect him to learn. Yelling and beating will accomplish nothing more than teaching your dog to stay away from you when you are ranting. The shake can will eliminate all of that. When you catch your dog performing the ill behavior, THROW the can at him. Try to throw the can so that it lands within the vicinity of the dog. If it inadvertently hits him, it will not hurt him. Throwing the can will divert his attention from his unwanted activity and have him focus on you. After you have thrown the can, give him your chosen command that is appropriate for the activity. For example if he's on the couch and you want him off, throw the can and say 'OFF'. If he's chewing up something he shouldn't, throw the can and say 'Leave it'. Once the can has been thrown two or three times, the dog will understand and recognize the sound of the pennies in the can. You will no longer have a need to throw the can, simply shake the can, and give your command. Mouthing/nipping/growling - Testing how far he can go. Although many consider a puppy that is mouthing to be a playful gesture, the dog or puppy may be testing his ability to gain a higher position in the pack. Once he learns that you will pull away from him when he nips you, he will use that action to keep you at bay. Before this "Game" escalates to the level of the dog growling, barking, and nipping at you, stop him and the "Game." Allowing it to continue will reach a point where you will call a professional for the behavior problem you are having, or, you will want to be rid of him. Most puppies when first brought into the home will mouth or nip at you. This is the way they played and determined the pecking order within their litter. Although many owners think this is okay, or just puppy play, it is not. The puppy is developing a habit that will eventually become annoying or painful. If your dog or puppy is mouthing or nipping at you, this is not play. Once he learns that you will pull away from him when he nips you, he will use that action to keep you at bay. Before this escalates to the level of the dog growling, barking, and nipping at you, stop him now. Allowing it to continue will reach a point where you will call a professional for the behavior problem you are having, or, you will want to be rid of him. The method that I have found to work the fastest on young dogs and puppies is to apply an uppercut to the lower jaw, causing his teeth to clash together. This correction is performed to cause discomfort to the dog, and not an attempt at knocking him out. Simply correct him with enough force to cause his teeth to clash, and the behavior will usually cease after the second correction. The dog's response to the correction is normally an attempt to lick your hands. Do not overreact and strike him again. The licking is his indicator of acceptance of your leadership and correction. If he licks, praise him. If he mouths, correct him again. The correction must be meaningful and forceful enough to get his attention. Holding your hand with the palm facing up, as though someone were going to place money in your hand, close your hand into a fist. Move your thumb so that it is alongside the forefinger and out of the way of the flat portion of your knuckles. With that portion of your hand you will apply a swift correction to the underside of the lower jaw. This correction must be applied swiftly and in a timely manner. Do not chase the dog around the house trying to make the correction, but make the correction at the exact time of the mouthing or biting. If he bites his tongue in the process, he will stop the behavior immediately. Never make a correction to the top or side of the nose with your hand or any devices. Doing so will only serve to agitate him, and incite him to become more aggressive. A puppy may submit temporarily, but, as he matures, he will attempt the challenge again. You must be aware of the action and be prepared to make the correction. Using a water gun or spray bottle to spray into the dog's face is also effective. Mix a solution of eight ounces of water with a teaspoonful of vinegar, and place it in your spray bottle. This will distract him from the undesirable behavior, at which time you should give a verbal command for a more acceptable action. If you should make a correction, and your puppy growls or charges you, grab him by the nape of the neck and roll him to the floor on his back or side. Place your hand on his stomach and hold him there until he stops struggling. Do not let him up until he stops struggling. This maneuver is referred to as the "Alpha Roll," and can be effective when used on a puppy. DO NOT attempt the Alpha Roll on an adult dog. The results could be disastrous for you. An adult dog is stronger, faster, and much more persistent than a puppy. He will use whatever tactics he can to survive what he perceives as an attack. If you feel that you cannot handle your dog, or if you are fearful of him, then let a professional handle any situation involving an adult dog. They have the experience to handle large dogs, and this dog has not victimized them. Tug of War - Causes more problems than it cures. This game has been the cause of many mouthing, chewing, and biting problems because of the manner in which it is played. This game must be played properly to prevent your dog from assuming that he is victorious in this battle and develop the idea that he is "The Boss." The root cause of the problem stems from owners who play this game and enjoy watching the actions of the dog as he tugs, twists, and growls while trying to take the toy away. After a few minutes of play, owners grow tired of the game, and allow the dog to have the toy. This sends a message to the dog that if he continues to bite hard, hang on, and tug hard enough, he can win the game. In time, the dog will come to believe that he can overpower the owner, and it could create a situation where the dog will challenge you for leadership. Attempts to correct his undesired actions will be seen as a challenge to his position, and he will fight harder to retain his position as the leader of the pack. To avoid any challenge by the dog, this game should not be played. Children should be discouraged from playing this game, as the dog could perceive it as teasing by the younger, or lesser, figures in the pack. Always keep in mind that children are more at eye level to the dog, and, because of this, the dog could believe that they are challenging him. Many dogs will remember a teasing and retaliate when least expected. If the game is played, it must be done so that you are the winner every time you play. The dog can never be allowed to win the game. When the game becomes tiresome to you, take the tug toy away from the dog so that he does not perceive himself as being victorious, and do not allow him to have it. After waiting approximately 10 minutes you may toss the toy to him so that he may play with it, but do not engage in the game again. He will believe that you won the battle, and that you are finished playing with the toy. Since you no longer want the toy, he may have it. This will help the dog to identify you as a fair leader. Using a tug is one of the methods used in strengthening a dog's jaw muscles and bite, as well as training him to attack. Tug of War has been successfully used to heighten the esteem of a submissive dog, but the method of play must be the same as described above. If you have a submissive dog, this will help you heighten his assuredness, but I urge you to seek the advice of a professional before you attempt this practice. If you are not performing the task properly, the results could be disastrous. Carsickness - Can be cured with a little time and patience. Some puppies will get carsick the first time they ride. Others will get sick every time they ride. It is a new motion being experienced without having to move their feet. It happens to people, so do not get upset with your dog. All that is happening is his stomach gets upset. The first sign of carsickness, actually motion sickness, is the lack of animation in your dog. Next comes drooling. You will see your pup begin to drool profusely. If the ride is a long one, the pup will usually empty his stomach and continue to drool. There are dogs that never get carsick. Some are able to build a tolerance to the motion of the car, but it takes time. If the only time your dog gets to ride is when he goes to the vet, one of two things is going to happen. First, he knows every time he gets in the car, he ends up at the veterinarian's office, where he is poked and prodded, and usually ends up with a shot, and that is not what he considers a fun outing. He will fight to keep from getting in the car, because the only time he gets in the car, he is headed for the veterinarian. Second, he is not used to the motion of the car, and it is going to affect his equilibrium and his stomach, making him throw up. The training required here is going to take time, so do not expect this to be done in a few days. Place the dog in the car, and allow him to just sit or walk around for a while. After about 10 minutes, take him out of the car, and that part of training is over for the day. If you want to do this twice a day, make certain there is a 3 - 4 hour break between sessions. Continue placing him in the car until he is getting in willingly and no longer fighting you. Once he has accepted the fact that the car is not a danger, take him for a short drive. Travel about 3 - 4 blocks and stop. In the time it takes to travel four blocks, the dog may begin to feel the symptoms of being sick, but he will not throw up. After stopping, take him out of the car and walk around with him for about 10 minutes. After he has relaxed, put him back into the car and drive home. When you get home, take him out of the car, praise him for being such a great dog, and let him play for another 10 minutes before you attempt any other training. Continue doing this for about 3 days, and then increase your distance by one or two blocks. Again, spend 2 - 3 days working at this distance and then advance. Within a few weeks, you will be able to travel all over town, your dog will not get sick, and you will not have to worry about cleaning up the car. Taking the short rides will also help the dog relax, and those vet visits will not be so hard. When he is traveling well, start taking a few trips to the vet's office just to say hello, not for any examination or shots, just a visit. If the vet is not too busy, ask if he will come out and pet the dog, just to say hello. This will help to relax him and relieve some of the stress about being there. Now, let us put this in perspective. If the only time you were to get a ride was when you had to go to the doctor, I will bet you would put up a fight when they tried to get you into the car. Therefore, you see, those short rides let the dog know that he will not be going to the vet each time he gets into the car, and the visits to the vet will not always be so stressful. If the dog is one that does not show any improvement, try giving him about one teaspoonful of anti-acid approximately 15 minutes prior to traveling in order to help settle his stomach. This helps some dogs get over the problem. Prescription medications are available for this problem, and Dramamine administered by body weight may ease the situation. There is a side affect to doing this. The dog will become drowsy and listless for approximately 8 - 10 hours. I do not suggest doing this without checking with your veterinarian and ensuring that your dog can handle the medication. Do not expect any training to work after the first or second try. It takes a little longer for some dogs to adjust. Some have taken up to eight weeks. Be patient and consistent, and it will happen. House Train in 7-10 Days - The top help request! The number one problem of House Training stems from those owners that start out by placing newspaper on the floor and directing their dog to use the paper. Placing paper on the floor may make it faster and easier to remove waste from the home, but it is confusing to the dog. In all likelihood, your puppy wasn't raised on newspaper, but utilized the kennel run or grass for his elimination. Then you bring him home, and place him in a room covered with paper. First he has to adjust to all the noise the paper makes, and then he has to be guided to use that paper to eliminate. Just about the time he is becoming adjusted to using the paper, the owner decides he wants the dog to use the outdoor facility. Do not place newspapers or pee pads on the floor and direct your dog to them. Doing this is teaching your puppy that it is okay to relieve himself in the house. This is not what you want, so don't confuse the pup. Before you can begin to house train a dog, you must observe the times the dog, especially a puppy, is eating. Puppies don't hold their food for very long, and will usually relieve themselves within 15 minutes of eating. If you are leaving food available for your puppy to eat 24 hours a day, then you may encounter some problems training your dog. "If you control the food, you control the dog." From birth until the first pieces of solid food were presented to the puppies, feeding time was dependent on the puppy's mother. If she didn't want to lie down and nurse them, she didn't. When she felt it was time to eat, she would feed them. Food was not available to them around the clock. It was regulated. The reason she regulated this food was because young puppies cannot relieve themselves and must be stimulated. So, Mom would regulate the amount of food and the time they received it in order to prevent the puppies from being overfed. Then, during and directly after eating, she would lick each of the pups, stimulating them to relieve themselves. This ritual of eating and relieving continues on after weaning. Puppies will eat and look for a place to relieve themselves, until they learn to hold their bowel and bladder functions. A puppy will require being fed 2-3 times a day. At feeding time, allow the puppy 15-20 minutes to eat and drink as much as it desires, then pick up the food. If the puppy has played through its feeding time, then so be it. Pick up the food, and offer it at the next feeding time. You should not give your puppy any other food or treats while you are house training. When the next feeding time comes, he will concentrate on getting something to eat. If he doesn't eat, don't get excited. By the third feeding, he will be more than happy to eat. Be sure that he gets water, even if you have to take him to the bowl to drink. This is controlling the food. As you continue along with this program, you will see how it helps to control the dog. After your puppy has finished eating and drinking give the verbal command "Outside", and take him outside. Stay outside with the puppy until he has completed both functions. This may take 10 - 20 minutes, but don't leave him or engage in any play activity until he has relieved himself. Don't put him out the door by himself and expect him to do what you want. Putting him out alone is going to create a degree of stress about being in a place where he is all alone, and he will not concentrate on relieving himself, but will utilize all his efforts in regaining access to your presence. When he finds a spot and begins to eliminate, give a verbal command such as "Hurry up", "Go Potty" or "Take a Break" while he is eliminating. As soon as he is finished, you must praise him verbally and physically. Don't just stand in a corner and tell him he did good. Go to him. Don't charge at him, but walk to him. Pat, stroke, and tell him what a good puppy he is while repeating the command. For example, pet him and say, "Hurry up, Good boy, Good Hurry up." Hearing your voice of pleasure and being touched will instill in the dog what you want him to do. He is learning that it pleases you when he goes outside to do his business. Using the command words during the elimination period will teach your dog to go on command. You will appreciate this command and its response on those rainy days or when you are in a hurry. Now that the elimination process is completed, allow the puppy time to play and explore for an additional 10-15 minutes. Do not pick him up and take him back inside as soon as he is finished eliminating. Taking the puppy inside immediately after he is finished will serve to discourage him going out to eliminate. Then, when he is placed outside, he will begin to hold his bowel movements so that he has time to play while outside and eliminate when he is taken back inside. Give the pup some time to play when he is finished with his bathroom duties. This will assure him that he is allowed to play, and that being outside to eliminate is not a punishment. When he has expended some of that energy, take him inside. Most puppies and dogs learn this exercise in 7-10 days. Be patient, and don't try to rush him. This is an important function, and you can't fool mother nature. If you have a particular spot in your yard where you would like your pup to go to relieve himself, then try the following. Purchase a bottle of sudsy household ammonia and pour it in the area you desire. Allow it to seep into the soil, and then expose him to that area. The dog will be attracted to the smell of the ammonia and will begin using it as his own elimination area. If your puppy has an accident in the house, don't rub his nose in it or spank him. I could never figure out what was accomplished by rubbing a dog's nose in its mess. He knows what it is, and he already knows what it smells like, so what are you telling this dog? Absolutely nothing! You are only confusing the dog by doing this. What you should do is command "Outside", pick up the puppy, place him outside, and then clean up the mess. Do not let the puppy see you cleaning up his mess. If he is allowed to watch you clean up what he did, he will think you liked it and soon do it again in the same spot. Clean up the mess with a "Non-Ammonia" based product. Ammonia is in urine and feces, and the pup will think that another dog was there and marked the same spot where he eliminated, and, so, he will be attracted back to that spot. If you catch your puppy in the act, you should calmly say "Outside," pick him up, and take him out. Even if he is in the middle of doing it, you should just pick him up and take him out. Don't get up yelling at him. He is doing what is natural, and your yelling at him will cause him to think elimination in front of you is wrong. In your eyes, he did do something wrong, but to him it is a natural function. Your yelling at the dog while he is eliminating could cause the pup to think that he must not let you see him eliminate, and he will begin hiding to relieve himself so that he isn't reprimanded. This problem can be harder to correct than simple house training. Pick him up and place him outside. Follow the above guide as if it were a normal routine. Keep in mind that you interrupted him, and it may take a little longer for him to get going again. Just be patient. It will pay off in the end. Crate Training - Providing your dog the security he would have in a den. 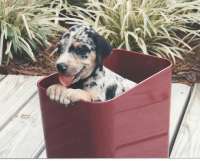 The shipping and holding type containers used for transporting dogs via airlines are referred to as crates. They may be made of wire, plastic, or a combination of the two. The crate should be of a size that will allow the dog ease of movement when inside. Ideally, there should be enough room in the crate for the dog to stand comfortably and turn around. The size can be determined by measuring your dog from the ground to the withers (top of shoulder), then add four (4) inches. Some owners believe the use of crates in the home is cruel and uncaring. So that there is no misunderstanding about the use of crates, let us look at what dogs in the wild do. Dogs are territorial and mark their surroundings with their scent by urinating on the ground or objects in the area that they have claimed as theirs. This tells other dogs that may wander into this area that this territory has been claimed. Within the territory, a dog will seek out a small, enclosed area, called a den. The den is the dog's safe haven where it will sleep and go to escape danger or bad weather. The den is generally a place that is completely covered, except for the entrance, and resembles a cave. This offers the dog a means of feeling safe from any attacks from the rear, where he has only to watch the opening for oncoming danger. This allows the dog the opportunity to escape or defend his domain. He is comfortable knowing that he has to guard only one opening and that nothing can approach from any other direction. This instinct is in all dogs: wild and domestic. Crate training is a means of providing your dog his own place of safety, his den, within the home. Why crate train? It provides the dog with a place of his own, where he can feel secure and comfortable. It provides the owner with a means of removing the dog from the presence of those that are uncomfortable around dogs, without completely isolating the dog from its family. It is best to start crate training your dog while he is still a puppy. This will help establish some of the ground rules, without causing too much stress. Start by placing a toy or treat in the crate and letting him go inside to get it. Allow him to go slowly. A new crate has a number of different scents on it, and it may be a bit confusing to him. Before you acquired the crate, numerous people handled it, and their scents are on it,as well. Just let the puppy take his time. Do not force the puppy into the crate, as this will scare him and cause him to develop a fear of being placed in it. If this happens, you will have to fight with him just to get him inside. Once the puppy is in the crate, play with him. Do not close the door. Block the opening with your body, but allow him the time to become comfortable in knowing that the crate is not a danger. When he is going in and out of the crate freely and without hesitation, you may then close the door. When the door is closed and the puppy realizes that he cannot get out, he may begin to chew or claw the crate. On the other hand, he may begin howling or barking. If this happens, ignore him. Any attention you pay him while he is trying to escape the crate tells the dog that he can get your attention by chewing, clawing, barking, or howling. The dog is now training you. Allow him some time to settle down and relax. Remember to leave a toy with him to prevent him from being bored. Once he has calmed down and rested for approximately 20 minutes, you may allow him out of his crate. Do not release him from the crate while he is misbehaving. This will only serve to tell him that the more noise and fuss he creates, the more attention he will get. This training will require a few days of this ritual, until the pup realizes that he must go in the crate and remain quiet if he wants to be allowed out. When placing him in the crate, use a command word such as, "Crate" or "Kennel" to help instill in him the action you want. Choose a word, and stick with it. Changing the command word, or mixing it with other commands, will only confuse the dog. The majority of crating problems arise when dogs are placed in open wire crates for them to spend the night. The dog will become anxious, because he has to watch all sides of an open wire crate for signs of danger. You will find that covering the crate with a sheet or some type of cover, so that only the door may be viewed, will eliminate the stress and help to get the dog inside. When training a dog that is past the puppy stage, it can be a bit trying. If the dog is not used to a crate and struggles with you when placing him in his crate, try placing him in the crate backwards. In other words, position him so that his rear goes into the crate first. By easing him backward into the crate, he is always looking at you and will feel more at ease. Your hands will be all over him, he can see you, and he will feel safe. Crate training will help minimize Separation Anxiety and avoid destructive behavior. A dog that is allowed full run of the house, especially when no one is there, will eventually become bored and find something with which to entertain himself. After all, staying home alone can be boring, and rearranging furniture, woodwork, carpet, and clothing can be a lot more fun than just lying on the floor waiting for someone to come home and play. Running Away - Don't chase after him! This problem results from the dog that was never taught the "Come" command properly. If your dog is running away from you, do not chase after him. Chase is a dog's favorite game, and all that yelling makes him think you are having as much fun as he is. Since they enjoy this game so much, turn the tables on him. Call his name, say all the things you would if you were chasing him, and run away. Your dog will believe you are playing his game, but the roles have been reversed and now he is the one chasing you. When he is within reach of you, grab him, and praise him for coming. Running away has been described in two different manners. First, the dog will run away from its owner when it is called. Second, the dog will run out of the door or yard the instant a door or gate is opened. The following exercises should be performed in an enclosed area prior to any attempts in an open area where the dog could possibly become injured during the sequences. Caution must be observed in every training exercise to ensure safety and consistency. The first problem, running away when called, is the action of a dog that was not taught the "Come" command properly, and the owner is probably chasing after the dog. If your dog decides to run away from you, do not chase after him. Chase is a dog's favorite game, and all that yelling and name-calling makes him believe that you are having as much fun as he is. Since they enjoy this game of chase so much, turn the tables on him, and have him chase you. Call his name, clap your hands, say all the things you would if you were chasing him, and you run away from him. Your dog will believe you are playing, but the roles have been reversed and now he is the one chasing you. When he is within reach of you, grab him, and praise him for coming. Some dogs will come toward you, but stay just out of reach. Then they turn and go in the opposite direction, stop, and look back at you. When you walk toward them, they will run a short distance, stop, and look at you again. With this behavior, you should continue to walk, not run, toward the dog, repeating his name and the come command. Regardless of where he goes or what he does, continue to pursue him, but do not run. Eventually, he will realize that you are not going to give up, and he will display submissive gestures. He may lie down and crawl, or roll over on his back. When this happens, continue toward him slowly. Place his lead on him, command come, and begin walking back to the very spot where you first called him. Repeat the come command as you walk with him. If he is reluctant to go with you, continue to walk without stopping. Do not allow him to control the situation. When you arrive at the spot where you first called him, stop and praise him while repeating the come command. You want him to understand that coming to you is the most pleasant thing he will ever experience. The second problem, running away when a door is opened, can be corrected by placing a lead on the dog and working with him when you answer a door. If he attempts to charge out of the door, make a sharp correction, and place him in the sit/stay position. You may also practice opening the door when no one is there. Simply position yourself to the outside of the opening so that the door may be opened without interference from your body. Allow the dog to approach, keeping him to the center of the door. When you open the door, do it rapidly so that the door bumps against his nose. Then, as fast as you opened it, close it again. Command the dog to sit. If he does not, do the same routine again. You may have to do this a few times before the dog understands that the door is going to bump him in the nose if he does not sit and stay while the door is being opened. This procedure will work with a gate in the same manner. For sliding doors, train the dog with a door that swings on a hinge, or using lead corrections, and he will get the idea about waiting for the sliding door. Never call your dog to you to make a correction. Regardless of what the dog has done, do not call him and then make a correction. If he has done something wrong, go to him and make the correction, but never call him to you for a correction. Timing is the most important thing when making a correction. If you have not caught him performing an improper behavior within three (3) seconds of that behavior, then it is too late to correct him. He must be caught in the act in order for him to understand your correction. Calling him, then making a correction will only make him want to stay away from you. Anytime you call your dog it should be immediately followed with praise. Even if you come home and find that the Mink Coat has been chewed to shreds, if you call him, you must praise him. If you come home and you catch him chewing the coat, you go to him and make the correction, but do not call him to you. Calling a dog to you and then making a correction will only condition the dog to stay away from you to prevent any corrections. For example, if I called you, and then when you arrived I slapped you, would you come to me when I called again? Neither will your dog. Chewing - Most chewing problems are from anxiety. Chewing, or, "Boy, this feels good on my gums," can drive owners crazy. The problem of chewing is not the puppy's idea of getting even with you. He doesn't have hands, so investigating anything is done with the mouth, plus, he is trying to get relief from those growing, pesky teeth. Some owners believe they are doing a good thing by giving the puppy an old shoe or sock to chew on. It keeps the puppy quiet, and that suits the owner. Unfortunately, the puppy knows only scent and not descriptive articles. If you gave him an old shoe to chew on, don't get angry when he chews up your good shoes. Those "good" shoes have the same scent as the old ones. Socks? They have your scent on them, and they're fabric. Your scent is everywhere. You told him it was okay to chew these things, and now he does. Chewing by puppies is most often caused by the teeth breaking through the gums. Adult teeth will begin replacing puppy or milk teeth at about four to five months of age. Chewing is the only way a puppy can get relief from this irritation. The best way to avoid chewing problems is to keep them from starting. Provide him with a nylon bone, beef or chicken flavored are best, and a hard rubber toy, such as a Kong. Some of the hard rubber toys have a hole in them where you can place a little peanut butter or treat inside. This will keep your puppy busy for hours, and his chewing will be directed where it can not cause any harm. If you catch your dog in the act of chewing, correct him by saying "Leave it", and distract him with his own chew toy. 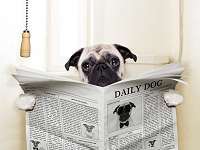 If your puppy is insistent on getting back to the other article, move either the dog or the article. You must be persistent in your instructions and consistent in your training. If he moves back 10 times, make the correction 11 times. Do not allow him win. Keep in mind that more changes in teething occur at 10 months of age. Most people don't realize this and confuse it with a behavior problem. They believe the dog has become spiteful. This is not the case. At approximately 10 months of age, the teeth will begin to set into the jawbone, and the chewing will begin again. Just be ready for it. I discourage using rawhide, pig ears, cow hooves, and the like, because the dog or puppy will obtain a level of success in destroying these things. Once he has won a victory over this, he may decide to challenge your sofa, table legs, woodwork, carpet or whatever he can successfully get his teeth into. If you have a persistent chewer, try this: Purchase a can of Unscented Aerosol Deodorant (without hexachlorophene). When you find an article that has been chewed, take the dog to the item or area, but do not let him see the deodorant can. As he approaches the item, spray at an angle across his nose. When he retreats, stop spraying. Place the dog in an area where he cannot see what you are doing, and spray the article and/or the area with the deodorant. When he smells the deodorant, which he is able to do because of his keen sense of smell, he will remember the sound and discomfort and stay away from the article. This practice may take a few days to cease the chewing, so continue the procedure until the action stops. There are "no chew/stop chew" products on the market that are supposed to stop your dog from chewing. Some people have had success with them, and others have not. Hot sauce and pepper may deter the chewing temporarily, but usually the dog develops a taste for it. The only tried and true methods are persistence and consistency. Occupy your dog's attention with its own toys, discourage destructive chewing, and ensure that he gets the proper amount of exercise. Boredom will cause chewing, including chewing on itself. Barking - A Barking dog is not always a problem. Barking is not always a problem. It is a means of voicing excitement, joy, and/or a warning. They cannot speak our language, so they try to communicate using their language. In fact, barking can be used to aid you if you want a dog that will let you know when there is danger or some disturbance about the house. Incessant barking is a problem. 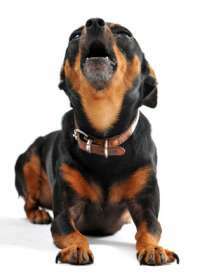 Most often, incessant barking is caused by boredom, the lack of exercise, or insufficient exercise. Dogs that are not socialized with people or other animals will also acquire this trait. If you have not socialized your dog with others outside of the home, then begin taking him for walks around the neighborhood or in the shopping center parking lot, where he is not on his territory. This action has calmed many dogs. Being away from their territory, they are not sure of what to expect and are more dependent on your actions. Have strangers come up to him and pet him. If he is still out of control in these areas, then place him in an obedience class where he will learn various commands. These commands will help to give you the appearance of being the Alpha authority, and your dog will calm down. Obedience training is not just for the Show Dog. Its aim is to teach him some manners. That is what obedience classes teach. Your dog learns manners and understands that you are the authority, not him. A barking dog cannot hear your voice because the inside of the ear closes up when it is barking. This is similar to your putting your fingers in your ears. You can hear the sound, but it is muffled. You have to break through the barking level and reach the inner ear with a noise that will penetrate the closed flap. Water is one of the easiest ways to get a grip on this problem. If your dog lives outdoors and has a confined area, you may use a water hose. When the barking starts, give the command "Quiet" and spray him directly in the face with the water. I know there are dogs that love the water, but I have not found one yet that likes a full stream of water hitting them in the face. You may have to do this a number of times, but if you are persistent, you will have a dog that understands what quiet means. If your dog is a housedog, you do not want to use a water hose, but you can use a water gun or spray bottle. Use the same procedure; only substitute the water gun or spray bottle for the hose. Give the command, make a noise, and squirt the water in his face. You may try adding a teaspoonful of vinegar to eight ounces of water. This sometimes helps discourage barking. Distraction from what he is doing is the only way you are going to achieve results. If you are frustrated and do not distract him first, you are wasting your time. He must be distracted from what is causing the barking before you can make any corrections. In the home, you do not want to run around the house with a water gun all day, so you want to try a Shake Can. 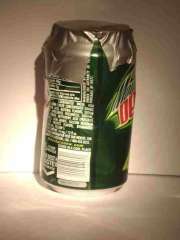 To make a Shake Can, use an empty soda can, rinse it out thoroughly with hot water, and allow it to dry. When it is dry, place 10-15 pennies inside, and tape the top closed with duct tape so the pennies will not fall out. You have just created your own correction device for the cost of a soda plus a few pennies. When your dog is misbehaving or performing an unwanted action, throw the can to distract him from the offensive action, and gain his attention. Give him the command you desire, and retrieve your can. Being made of soft aluminum, if the can hits him, it will not hurt him, but the noise will definitely get his attention. After a few incidents of having the can and the noise suddenly appear because of his actions, the sound of the can being shaken will be enough to get his attention. This is the most effective and least costly piece of equipment you will ever own. Some owners will scoff at the idea of the shake can and its effectiveness, but, once they have used it, they will continue to keep one or two on hand. Often, wishing they had known about it much earlier. Jumping - Proper position and timing. Jumping up to greet you is a dog's way of getting your attention. He must be taught that he does not have to jump on you to get your attention. Placing your hands on him to push him away, sends the wrong message. When placing your hands on your dog, you are giving your approval of his actions, and, since you pushed him away with your hands, he will continue the action in an attempt to get that approval. When your puppy makes an attempt to jump on you, step directly into him and say nothing to him. This may topple him over, but he will think he misjudged his jump. When he tries again, do the same thing. Continue stepping into him until he stops jumping. Teach him that he must sit if he wants your attention. When he understands that sitting will get him the attention he desires he will stop jumping up to greet you. In other words, make him work for the attention. By jumping on you, he is demanding attention. Teach him that he will get attention only if he sits in front of you. You must be more persistent than the puppy. He will tire of the jump up and fall over game much faster than you. Stay with it, and you will be rewarded with a puppy that does not jump on you. You must be consistent and persistent if you are to succeed. Another method of stopping this action is to step on his rear toes. This is usually done when you are sitting down and the pup attempts to jump on you. Do not step so hard that you hurt him, but use just enough pressure to make it uncomfortable. When he gets off of you, command him to sit. Then praise him for sitting. Whenever using either method of correction, do not talk to the dog or give him any command. You want the dog to think that the discomfort or falling is being caused by him, and not by you. When he perceives the problem to be one he has caused, he will stop jumping. When an adult dog jumps on you, your first instinct is to place your hands on him and push him away. Just as with a puppy, placing your hands on the adult dog is a sign of approval, that this is acceptable behavior and that you approve of the action, even though you are trying to prevent his jumping on you. To correct this problem, begin by allowing the dog to jump up. Do not tell him to jump on you, just allow it if he attempts to do so. When his head is above your knee, place your knee into his chest firmly. Do not try to knock him out, just cause some discomfort. The key to making this method work is for the dog not to see the correction. If you allow his head to rise above your knee prior to making the correction, he will not see the correction being made. He will be convinced that he has caused the discomfort to himself, and he will cease jumping. If he sees you trying to knee him, he will know that you are the force behind the discomfort, and he will change his strategy, and begin jumping from the side, from behind, or both. Let the correction be a surprise to him, and don't let him see it coming. Correcting in this manner will take only two or three times to make him think before jumping on you. If you want to use a command in conjunction with the action, say "Off." Once he is off of you, do not touch him. You may talk to him or call him back to you, but do not touch him or repeat the command. When he is giving the indication that he wants to jump, but he does not, give him the command to sit. When he sits, then you may touch and praise him, but don't allow him to jump up from that position. If your dog is too small for you to use your knee, try stepping on his rear toes when he jumps on you. Don't crush the toes, but simply step on them with enough pressure to cause him discomfort. He will realize that every time he gets on you, his toes hurt, and he will stop jumping up. No matter who the dog jumps on, the correction must be applied by the individual. This technique usually takes 2 -3 instances for the dog to begin to understand that jumping on people is uncomfortable. One week of training is the longest I've ever seen a dog continue jumping before ending the action. I believe the reason for this length of time to be that the family was not enforcing the correction as a unit, and the dog was confused. Separation Anxiety - Say nothing further to him. A great many Separation Anxiety problems begin at the puppy stage and advance throughout the adolescent years and into adulthood. Owners think they are doing what is right, but they are actually creating this problem. A lot of time is spent with the puppy while it is new to the household. This is good for the puppy's socialization, but he becomes dependent on the pack. There must be a balance of socialization and isolation, or independence. By spending too much time with the puppy, you are conveying to him that he does not have to worry about anything, because the pack is strong and someone is always there to take care of him. 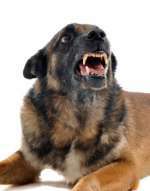 This can cause the puppy to become dependent on those around him and loose his assertiveness. As the puppy begins to grow, less time is spent playing with him, and the training sessions become shorter and farther apart. The pack always goes away to work, school, etc., and the puppy is left behind. Not only is he left behind, the pack goes through this ritual of letting him know he is being left behind with hugs, kisses, and pats of reassurance that you will return. 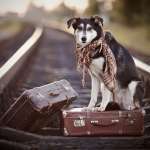 You believe he should be reassured, but what your dog hears is, "I am leaving, and you can't come with me." The puppy gets the feeling of being abandoned. He becomes anxious at your leaving, and he begins to bark, howl, run in circles, and, eventually, tries to grab hold of your clothing or your hand in an attempt to keep you with him. You stop what you are doing and try to console him. You think you are reassuring him about your leaving and returning, but all the dog knows is that he is going to be left alone. Your dog is not able to be with you, and he is not in a place that he considers his den. As he advances toward adulthood, these reassurances become more and more commonplace, and the anxiety builds in the dog. He becomes more anxious about your leaving and totally out of control when you return. Here is what the dog believes. You have said your goodbyes and he is now alone. All the barking and howling and carrying on, running up and down the house, have not brought you back, so the dog settles on the next best thing to your being there; your scent. Your scent is all over the house, and, if the dog has full run of the house, he is going to seek it out. He will find the places where the scent is the strongest, such as; Shoes, Clothes, Sofa, Bedding, etc., and his wanting to have your company will bring him to destructive behavior. This is separation anxiety. He becomes anxious with your coming and going, along with the attention he receives at each of these periods, which reinforces the fact that he is being left behind. He may begin running up and down the house, barking incessantly, or howling while you are gone. Then destructive behavior begins in the form of chewing personal belongings, woodwork, furniture, etc. To help eliminate separation anxiety, you must utilize Crate Training. Begin by placing your dog in a crate for short periods while you are home. He may make a ruckus at being placed in the crate, but ignore him. Let him bark or howl, but do not talk to him until he settles down for at least 15 minutes. When he has quieted down and is calm for 15 - 20 minutes, allow him out of his crate. Wait approximately 2 - 4 hours and repeat the process. This method will have him become accustomed to being in the crate while you are home, and it will help him to accept the fact that he must be in the crate (his new den) while you are away. When he has adjusted and accepted the crate as his den, place him in his crate for approximately 15 - 20 minutes, and then, without saying a word to him, go out of the house for about 10 minutes and come back inside. Wait about 5 minutes prior to talking to the dog. Repeat this daily and extend the time you are gone. This will help to calm him, giving him the positive reassurance that you are going to return. In time (up to 8 weeks in dogs with severe anxiety), the barking and howling while you are gone will end. When you have to leave him alone for a longer period, place him in his crate 15 minutes prior to your leaving. Be calm with him, pet and talk to him at the time you place him in the crate, and then do whatever duties you must perform before leaving the house. When it is time for you to go, leave without saying a word to the dog. DO NOT TALK TO THE DOG! Just go about your business of leaving as if he were not there. When you arrive home, IGNORE the dog. He has been waiting all day for you to come home, and, now that you are there, you should not make him the most important thing for your attention upon entering. Instead of visiting with him, go to the bathroom, take out the trash, or do something that will take about 15 - 20 minutes of your time. He knows you are there, he can smell you, but he has not been visited with, yet. After the elapsed time of 15 - 20 minutes, allow him out of the crate. If he becomes out of control or overly excited, place him in a sit-stay and make him wait to be petted. He will begin to understand that the pack has things it must do before attention is given to him. You place a structure in the dog's life that he will understand, and his confidence will be restored. The pack is there, but it has other things it must do. The pack is not there just for his entertainment. When crating, you should leave something that will keep him occupied. One way is to give him his favorite toy. A method I like to use is to place some creamy peanut butter or a treat inside a Kong toy. He will spend hours trying to get the peanut butter out, and he will not become anxious while the pack is gone. This is your starting point or foundation block on which to build. When you are training your dog, you will have him on your left side. You will be using your left hand to make the majority of the corrections. This may seem awkward at first, but you will become accustomed to having your dog at your left side within a few days. The controlled walk is an exercise in which your dog is made to pay attention to you, your body movements, and direction of travel. Do not confuse this exercise with the "Heel" command. You are not teaching your dog to heel, but you are teaching him to pay attention to your desired direction of travel. This is one of the most important steps in gaining control of your dog. Gaining your dog's attention and respect are paramount. In a classroom environment, students learn this exercise, and are sent home to practice. At the next session, the owners are remarking about how much differently their dogs are behaving. A lot of them say that this first lesson has seemed to calm their dogs a great deal. They find their dogs paying much more attention to them and no longer have to drag their lagging dog or have their dog dragging them down the street. I like this exercise for these reasons: (1) it gives the handler a lot of confidence; (2) it brings the dog under control rapidly; (3) your dog begins to respect you as a leader. 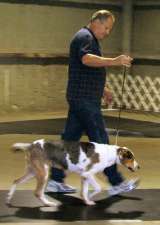 When this exercise is performed properly, the dog will focus all of his attention on the handler, and, probably for the first time, the dog views his owner/handler as a leader. This exercise can be performed with the dog wearing his flat collar or his correction collar. Make sure that the flat collar is tight enough that it will not slip over the dog's head. It should be tight enough that you cannot pull it off, yet have enough slack to allow for expansion of the neck muscles and breathing. When a dog is first placed on the lead for a walk, he will do one of the following; (1) take off running with you being dragged behind; (2) try to escape the control of the lead by lying down and refusing to move; (3) fight and/or bite at the lead; (4) try to run between your legs while cowering. These are all common problems and can be easily resolved. Once the collar and lead are connected, you will not talk to the dog. Do not give any commands, verbal praise, petting, or reassuring comments. If you are frustrated, remain quiet. Keep your frustrations non-verbal. Your dog should not hear any sound coming from you at this time. He must be taught to observe your body language and your choice of direction without any verbal direction or comment from you. Let us start with the dragger. This dog refuses to walk, fights/bites at the lead, or insists on lying on the ground. First, try coaxing the dog into walking toward you while he is wearing the lead. Talk to him and encourage him to move in your direction. If he gets up and starts to come to you, do not get all excited. Just keep happy tones and allow him to move toward you, and when he is within 2 feet of you, start walking backwards. This will have the dog trying to reach you, and you will be moving away slowly. Once the dog is reassured that no harm is going to come to him, you may begin walking him in the proper manner. If a dog refuses to move at all, even after being reassured by the above exercise, you will have to use a more forceful approach, otherwise the dog will be training you. This is not what you want, so you will have to show your leadership. Begin by walking in a straight line with the dog dragging behind. Do not walk and stop to look back, but just begin walking with conviction. This sounds like a horrible thing, but the greater majority of dogs will not allow you to drag them more than five (5) feet before getting to their feet and standing up. This can be compared to the child that decides it is not going to walk. They will throw themselves to the ground and refuse to move. Usually, the parent will take one hand and drag them, causing them to stand, or they will pick them up and carry them. You will not be carrying your dog around, so the only answer is to demonstrate your conviction and begin walking. Once standing, they will walk with some reluctance, but they will be walking. Do not jerk the lead, especially if this is a puppy less than six months of age. You must remember that there is no talking to the dog at this point. He would not walk when you were talking in pleasing tones, so now there will be no talking. This may sound cruel, but you are showing the dog that you have assumed control. When your dog realizes that he is losing this battle, he will give up and begin walking. There may be some lagging (staying behind you) at first, but eventually he will walk at your side. He has to gain confidence that all is well, even though he is being guided around. Once the confidence is there, he will walk willingly with you. You are teaching him that you have assumed control of the leader position and that you must be obeyed. Do not talk to the dog, do not give any commands, and do not wait on the dog. Once you begin, pick out an object at a distance of approximately 50 feet, and walk straight for it. Do not talk, hesitate, or stop until you get there. When you reach your destination, turn to the right, choose another object, and walk straight to it. You must walk rapidly and with conviction. You are not out for a stroll, but are training your dog. Step out with lively steps and at a speed that would be the midpoint between walking and jogging. This will have you walking at a speed just above your normal walk. If the dog thinks you are going to hesitate or wait on him, you will have trouble getting him to obey you. He must perceive you as the leader; therefore, you must walk with conviction and confidence. This exercise should not last any longer than five (5) minutes. If your dog is still fighting the lead, or is refusing to walk willingly, do not console him. Take him to get some water, and release him from the exercise. Do not try to accomplish too much in one session, and don't chastise the dog for not complying its first time at this. It is new to him and he is reluctant to give up control to you. When released from this exercise, spend some time playing with your dog. He is confused by the event that just took place and will be unsure of your actions. Give him a chance to settle down and regain his confidence. This is similar to the manner instructions were handed out in the litter. He was removed from the litter, allowed to do whatever he wanted within the limits of his boundaries, and now you are telling him that he no longer has that option. Be patient, it will happen. The dog that tries to get between your feet and cower is a very submissive dog. Do not make any harsh corrections. Walk without speaking. If the dog tries to get between your legs while you are walking, kick your heels in an upward motion, behind you, as you walk. Do not kick so hard that you will hurt the dog, but make it uncomfortable and awkward for him to get between your feet. Move them upward in a rapid motion. This type of walk may feel a little uncomfortable and unnatural at first, but it will cause the dog to feel uncomfortable with your feet moving all around its head. It will move out from between your legs in fear of being hit. You may hit your dog when you first start kicking up your heels, but you will not be doing it with a force that will hurt it. You want to move your feet just enough to make that area an uncomfortable place to be. Once the dog moves from between your feet, you must gently guide it to the left side. Do not drag the dog to your left side. Put enough continuous pressure on the lead to cause the dog to move to the left side while you are walking. Gentle, continuous tugs on the lead will help the dog to understand that there is no pressure from the lead when they walk beside you, only a constant tugging (nagging) when they do not. Now, here comes the puller. This dog decides that his walk is going to be fun, and off he goes dragging you behind him while you are yelling for him to slow down. You swear that you heard an announcement somewhere out there that said "Gentleman, Start Your Doggies" and it is off to the races while you are being dragged behind. This problem is much easier to correct than the dragger. As you begin your walk, the dog will take off out in front of you. What you will have to do is create slack in the lead. The best way to do this is to bring the lead as close to your body as possible then place your arm holding the lead straight out and pull it back to you as rapidly as you can. At the same time, change the direction you are walking. When he realizes that you have changed direction and he is being pulled, he will change direction, also, and will probably come running past you. The instant he passes you, you must pull on the lead and change directions again. When he realizes you have changed again, so will he. Continue this each time he passes by you. Change direction, sharply and with conviction. If he goes north, you go south. If he goes east, you go west. Try to make 180-degree turns in the beginning. Do not say anything to the dog during this time. Do not give any commands, talk, yell, chastise, or praise. Say nothing. The dog will go off expecting you to follow, because he thinks he is the leader and in charge. Whenever you change direction, he gets to the end of the lead, and, "bang," you are going in another direction. Now he has to catch up with you. Once he gets there, he decides he is going to lead. Off he goes in front of you, again. Bang, you change direction sharply, repeatedly. Each time he gets to the end of the leash, you suddenly decide to go in the opposite direction. Make these changes with conviction and confidence. Your dog has to trust you as the leader. If you are not confident that you are in charge and walk with conviction, he will not respect you. After a few of these rapid changes in direction, the dog will run alongside and look up at you. What the dog is thinking is, "I'll have to watch this guy. He doesn't know what he's doing or where he's going." When he looks up at you, praise him by saying, "Good Boy, Watch Me." With this type of dog, it usually takes about one (1) minute to convince them that you are in charge. Now you have gained control over the dog. Once you have his attention, you may make smoother turns to keep his attention focused on you. Instead of 180-degree turns, you may start making 90-degree turns. The most important thing in this whole exercise is walking with conviction and silence. Do not talk to the dog at all. When the exercise is completed (10 - 15 minutes), you may praise and talk to him. Again, take him to get a drink of water, release him from the exercise, and spend a few minutes playing with him. Within two days of this exercise, your dog will be paying much more attention to you when you have the lead on him, and those walks will begin to be more pleasurable for both of you. Continue working with the dog on this exercise for five days. Do not cheat yourself or your dog. If you want to work your dog more than once a day, be sure there is a four-hour break between training sessions. Do not overwork your dog. To work him in less than four-hour intervals, or to work him beyond the point of learning, will make him tire of the training, and he will rebel. Releasing your dog from an exercise is a formality that is often omitted. When the dog is no longer in a formal training session, and it's okay for him to run around and play, give him a command word so that he will understand that work time is over. Whenever I finish a training session, I replace the chain collar with the flat collar and give the command "Free Dog." When given this command, I allow the dog the freedom to run, play, and do whatever he enjoys. It just lets them know that they are back in control of themselves, and are allowed to go about the business of being a dog. As you progress in your training, he will understand that when you give him commands and directions, he must obey regardless of what collar he is wearing.